Beacons have been a buzzy topic for digital marketers in the past year, but mostly, brands have just used them to push out offers and coupons. Now, Medea—a maker of techy vodka bottles—has an interesting use case on how to use the small location-based markers. 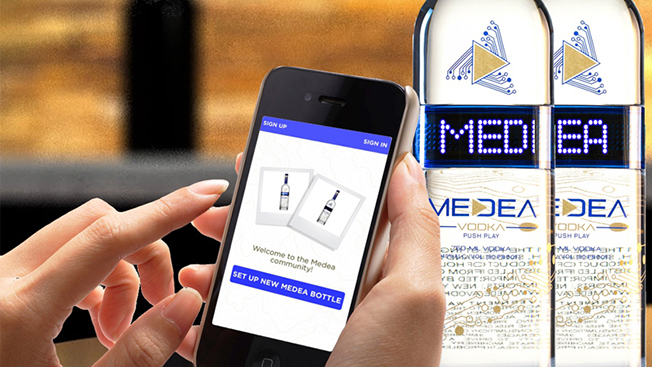 Medea is a vodka that retails for about $45 and features an LED band that wraps around the bottle to display strings of text. The bottles come pre-programmed with six common expressions like "happy birthday," "I love you" and "congratulations." The brand plans to launch a mobile app at the upcoming Nightlife & Bar Convention Show in Las Vegas from March 30 through April 1 that basically turns those pre-programmed expressions into custom messages. The LED bands are built with beacons in them so people can type their own messages of up to 254 characters when they are near a bottle. And as many as 10 different messages can be splashed across the bottle at one time. The app isn't just a showy use of technology—Medea plans to use it to alert people when a bottle is low. For example, when the band senses a near-empty bottle, the app could encourage folks to stock up and search for local stores where it's available. And given the alcohol industry's tight regulations around underage drinking, the app will help the brand identify owners' demographics. "The spirits industry sometimes lags behind other industries in its ability to determine, in an efficient way, the demographics of its customers, or what new uses or tastes a customer might want," said Brandon Laidlaw, Medea's founder.